Fall is a season of color. 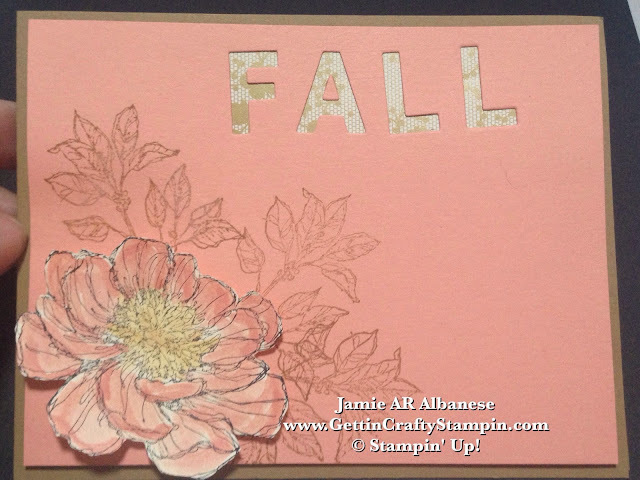 With pretty pinks, warm gold, crisp browns... so creating this Fall Blossom hand-stamped card is a fun way to celebrate the season and send some cheer. With easy to use tools like award winning rubber stamps, Little Letters Thinlits and stunning papers you, too, can create some Fall to send to family and friends in your hand-crafted projects! 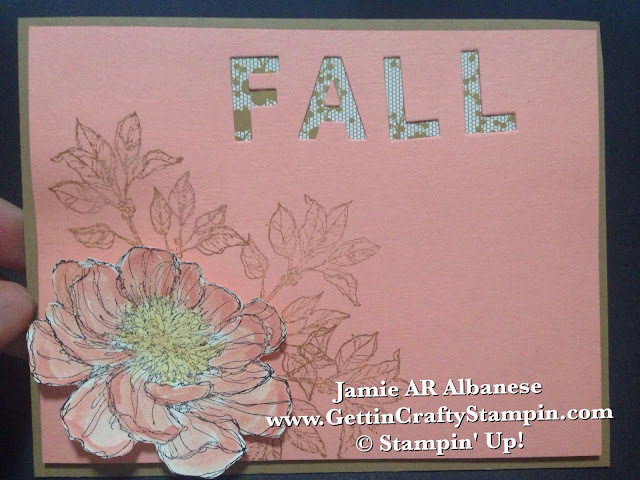 This fun hand-stamped card was from the Fall for Fall card class... did you miss it? 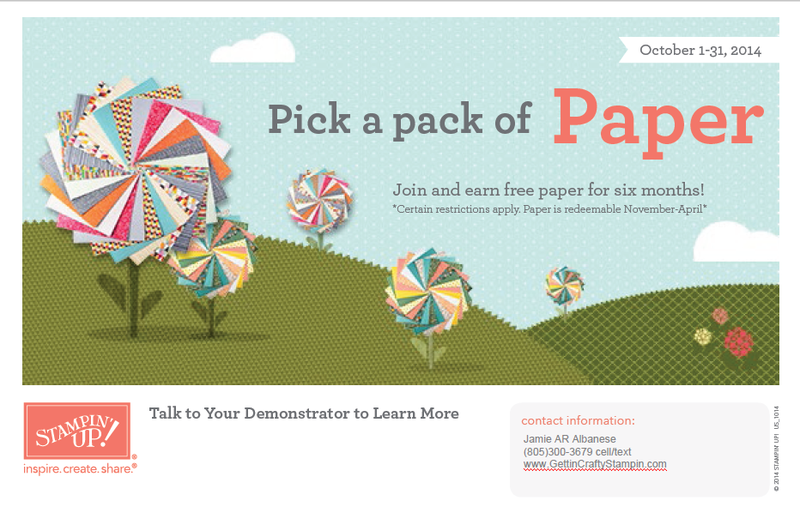 Join In on the crafting fun! Here you will be using the Baked Brown Sugar card stock for the base, layer the Crisp Cantaloupe card stock over it - (4"x5-1/4"). Stamp the leaves from the Hostess Exclusive, stunning, Bloom With Hope stamp set in one corner in the Baked Brown Sugar. Stamp the big flower from the Bloom with Hope stamp set on Very Vanilla card stock using the Jet Black Stazon ink pad. The Stazon ink is a solvent ink and will not wash when water colored. Squeeze the Crisp Cantaloupe and So Saffron ink pads while closed - this will create a palate of ink to use. Open and use this palate of ink with the Aqua Painter to water color the stamped image. I love the look of water colored images, don't you? I love the shiny gold in this Gold Soiree Designer Series Paper! Using the Little Letters Thinlits on the Crisp Cantaloupe card stock and the Big Shot with the Magnetic Platform. Die-Cut the letters to spell exactly what you want - here, I'm sending a bit of Fall to my loved ones. Save the letters and use them inside your card, on another project, etc. Lay the Gold Soiree Designer Series Paper behind the die-cut word to have additions of Gold and pattern, like this lace accent, peek through. 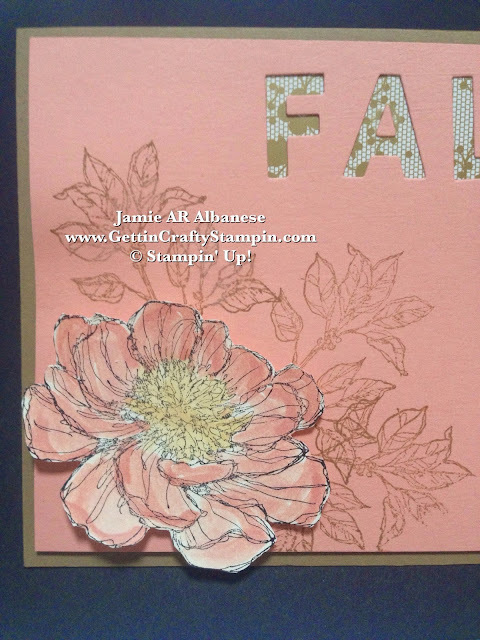 Once your assembling the hand-crafted card, add the flower you water colored and cut out (I love the Paper Snips to accurately, quickly and easily cut out the flower). 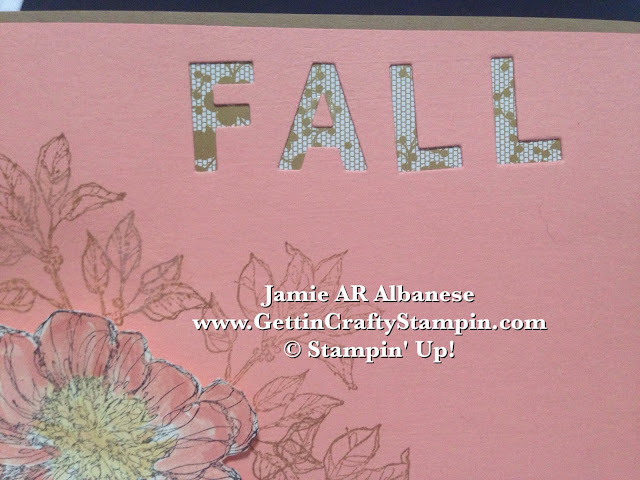 Add to the card front and give dimension when you use the Stampin' Dimensional adhesive. Send a pretty Fall Blossom filled hand-stamped card that will delight to your family and friends. This warm, soft colored, elegant card is easy and quick to create. It will live on and on when your loved ones display it. Deliver smiles and love when you give a little bit of Fall, lace and gold in this Fall Blossom hand-crafted card! We had a blast making this at the Fall for Fall card class, make sure YOU join us for our Upcoming Crafting and Card Making Classes - we would love to have you (To-Go class options, Private Class options and Kit Class options and more are available, too).